Travel to the coastal areas of Savannah for lunch on your own at Sandfly BBQ. Drive through the Historic and picturesque Isle of Hope Historic District and bluff landscaped with old oak trees covered in Spanish moss, the houses range in style from Greek Revival to Craftsman Bungalows. Continue with a visit to Wormsloe Plantation Tabby Ruins that date to the 18th Century for a docent led walking tour of the Georgia State Park Historic Site. Finally, a stop is scheduled at the Famous Savannah Byrd Cookie Company for sampling and shopping. 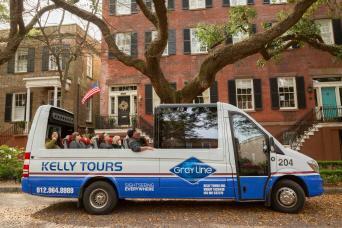 Mini-Bus Transfers to and from Savannah's Visitors Center for the Isle of Hope & Wormsloe Tour. Admission into the Georgia State Park Wormsloe Plantation. Gratuities for guides and driver. Departs from both the Savannah Visitors Center at 301 Martin Luther King Blvd. Tour departs at 12:00 p.m. only. Continue with a drive through the Historic and picturesque Isle of Hope Historic District. Landscaped with old oak trees covered in Spanish moss, the houses range in style from Greek Revival to Craftsman Bungalows. After this drive along the bluff, the thought of looking for a Realtor will come to mind. Continue with a visit to Wormsloe Plantation Tabby Ruins that date to the 18th Century for a docent led walking tour of the Georgia State Park Historic Site. Finally, a stop is scheduled at the Famous Savannah Byrd Cookie Company for shopping and tastings of Byrd’s Famous Cookies. Key Lime, Bennie Bits and Cheddar Cheese are just of few of the favorites. Mini-Bus departure at 12:00 pm from the Savannah Visitors Center 301 Martin Luther King Blvd for Isle of Hope & Wormsloe Tour . 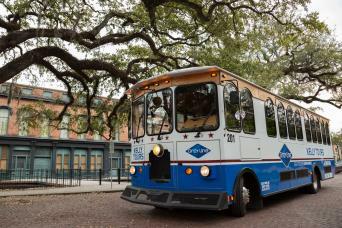 Arrive back to Historic Savannah at 5:00 pm. Adults $45.00 (13 and up) and Children $22.00 (12 and under). 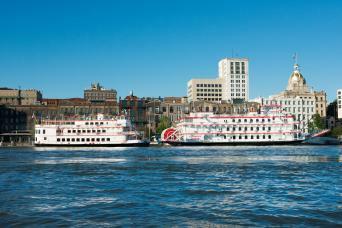 * Departure from Savannah's Visitors Center located at 301 Martin Luther King Blvd and Historic District Hotels.